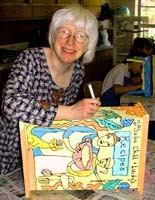 5-1-03 Turtle Trax Diary.Outsider Art quilts,paintings.Art Classes.Monthly Turtle Art Camps here.Susan Shie.Turtle Moon Studios. At left is a tiny painting I made for my friend Rev. Paul Schmidt, who saw my "Give Peace" painting and wanted one that said "Be Peace." Note: I barely got this diary done before midnight on May 1, so don't expect me to proof read it. Sound out anything you can't figure out, and don't email me with corrections, please. This is not a paying job! Two days ago, I got home from teaching in Lowell, MA, just in time to catch the blooming of the Lilacs here at home! Yea! We're a couple of weeks ahead of Lowell, it seems, in our tree and flower blooming. The crabapples in our front yard are about done for, in terms of flowering, but the daffodils Uncle Lester gave us last year are doing just fine yet. They look so pretty, sticking up through all the weeds I don't have time to go pull yet! They're putting a new roof on Truong and Mary's house across the street, where the Perleys used to live. I keep thinking about that amazing workshop in Lowell and am so happy I got to be their first visiting teacher, because that place is going to go wild. It's just that very few people know about them YET! You're going to hear all about Lowell at the end of this diary! Topics in this diary: "Daily Bread #3"; "Roses in the Snow for Mr. Rogers"; April, 03 Turtle Art Camp; "Year of the Sheep"; "Zonta Poster"; Aunt Pauline's house and move; "Peace Kitty at the UN"; Jimmy's article in Art of Angling Journal and Schmookler flask; Artsweek 2003; "Year of the Monkey"; Gretchen and Mike join the Catholic Church; Easter at Mama Wanda's; Visiting family in Jelloway; Friends Fabric Art's first Visiting Artist Workshop (me) in Lowell. Jimmy bought me an Airpen for Christmas, and for the first couple of months, I had a really hard time making it work. No teacher around and the instructions were pretty general. I found out that you can't use it with fabric paint over a painted fabric, that you have to draw with the Airpen first, then paint. Once I got that settled, along with some other do's and don't's, I got going. 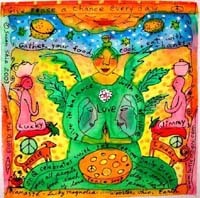 I joined eBay and PayPal this February and put my first auction up in mid February, of "Daily Bread #3," above. It's a painting done with Airpen and Deka fabric paint on unstretched muslin and is over 15" x 15". It sold. Yea! My paintings can fold up to be sent in a little mailer, which is great, and the buyer can either frame them behind glass or just hang them on the wall, or they can even quilt them. They just have to honor my copyright and not reproduce the image. Then nobody gets hurt! 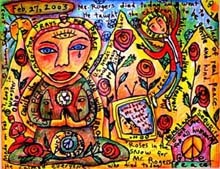 You can look at some of the paintings in the Peace Buddha Girls Gallery here on the site. I need to put more up, but now it's busy season, and when I get some free time, I have to get into our gardens somehow! Once again, the weeds are ahead of me! I did pull a few later today, after writing most of this diary and needing to go outside and get fresh air and do some ripping! That felt great! I'm sorta proof reading now, even tho I said I wouldn't, and it's still rainy and stormy, but I risked blowing up my Mac in a thunderstorm, just for you! The roof idea across the street had bad timing, and I feel bad that Truong and Mary may have some water damage, since the new shingles are not up yet. Let's hope it's ok.
Mr. Rogers died on Feb 27, and that night I made a little 8.5" x 11" drawing on card paper, with colored pencils and ink, about his death. 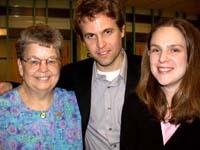 I hadn't seen him in years, but when Gretchen was little, she watched him a lot, and he was so very sweet to listen to. It seemed to be very sad timing, to have Mr. Rogers die, just as all the turmoil about going to war had all of us very upset. Not a good time to lose a peaceful soul like him. I was doing a lot with Duct Tape Peace Charm images during that time, when the government advised us to get some Duct Tape to protect ourselves... and I think there's one down in the bottom right corner of this drawing. Red roses started appearing more in my work around this time, too, and I am using them a lot. First ones were in my "Liberty Weeps for Her Country" painted quilt, made right after 9-11, and now they're often in my work. So Mr. Rogers got some red roses, too. From April 2 to 8, we had a really good Turtle Art Camp here, with three full time students and two overlapping part timers. In this photo are Carly Baird of Columbus, OH; me; Shelley Baird of Columbus, OH; Sherry Boram of Pendleton, IN; and Ruth Ann Molyneaux of Rockford, IL. This picture was taken by Jimmy on our last day of camp, in front of the gigantic Group Quilt the students made. So Terry Woodrow of Plano, TX, is missing, since she was here for the first four class days and left on Monday morning, instead of Tuesday morning. We all missed her a lot, but maybe I did the most, as Terry is a month younger than me, and we took lots of walks together. Here's Terry! She really enjoyed learning some airbrush stuff from Jimmy,and here are images of her motorcycle, in her first efforts at learning airbrush! She and her husband have Harleys, so this made her very happy, to be able to make some bikes for herself to use in her art. You can see some marks on the white sheet, above Terry's motorcycles, that are left over from Patty Hieb's "Tornado Warning" painting back in last November's camp! Patty, we haven't had any weather that extreme since you were here, although the winter was terribly hard and snowy, compared to your mild Seattle winter! Hmmm, proof reader Me would like to interject that tonight's weather is not as bad as the November tornado warnings, yet, but could get that way. Our white cat Rita is terrified of thunder now, in her middle age, and is hiding somewhere, since I'm busy typing. OK, here is the fabulous fake quilt made by the four remaining April Camp students on Monday evening. One thing I've started doing lately is to let the students add folded up fabric sections to the quilt, to fill in where they would be making my "shims", if they were really going to totally sew this thing together and keep it as a real quilt. 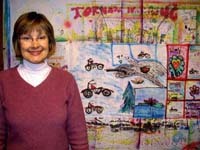 Just imagine what it would look like if Terry'd still been here with her motorcycle paintings and her Last Egg Sampler! I think being able to add in shims makes the students really plan the piece harder, and these guys really worked on theirs! The more I look at it tho, the more I think they hardly used any shims! They were good! They kept taking the panels all down and arranging them differently. I think I had to stop them, or they woulda kept on revising it. Then, of course, I showed them all how I sew things together on the wall, and made them each try the stitches, too. That's the whole point of the exercise, besides getting in some good cooperative energy in collaboration. This is a detail shot of my "Year of the Sheep" painting, about 15" square, that I made in March and sold on eBay. I really like the big head next to St Q, and am enjoying very much having St Q herself wear her Buddha Duds, now that she has merged with my earlier Buddha Girls images from the 80s and 90s. Quilta wore muu-muus and aprons for years, but now that Peace is a very unfashionable commodity in our lives, she chooses to embrace Peace in every way, right down to her wardrobe. I guess if I had to find clothes to look like the Buddha Duds, they'd be colorful union suits, so I will stick to men's pajama pants and tee shirts, myself, and let St Q do all the fashion statements. But I am very happy to be able to put my pacifist writings and images into my artwork and put it out into the world, hoping to maybe influence group consciousness somehow. It is not popular at all to embrace peace in our country, as the powers that be want to make pacifists feel like traitors. But we know differently. OK, off the soap box. Sorry! 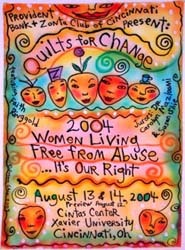 Last month I got invited to interact in a project by an organization called Zonta in Cincinnati, who is going to do a quilt show in 2004, called "Quilts for Change", to benefit their women's assistance charity. You can see the basic info here, but this is not a call for entries, and I am NOT the person to ask about how to enter the competition! The call for entries will be out soon. I'm going to be one of the jurors, along with Carolyn Mazloomi, and I did this poster for the event's publicity, using my trusty airbrush. This is my way to donate things to art auctions: make a poster on fabric about the event itself, and get it to them in time for them to use it. I can't stomach doing graphic art, but I am happy to let the graphics people play with my layout, in order to please themselves. They just can't mess with changing my images! My sweet little Aunt Pauline has now moved to Winchester, VA, to live with her daughter, my cousin Candy and her husband David. They moved her while I was in Lowell, so I missed helping out in the end. Aunt Pauline lived at her and my Uncle Russell's place near Orrville, about a half hour from us, nearly since they got married, back in the 40s. Uncle Russell died in 1995. He was my dad's younger brother, and Pauline is my mom's first cousin. They fixed my parents up! Anyhow, last month Candy came to do the final packing to get Aunt Pauline moved, and we went over to the house to visit. 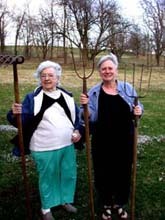 Here are Pauline and Candy, proudly holding up some powerful looking garden tools, and you can see their little fruit orchard in the background, up the hill. I have lots of memories of going over to their place, to play with Candy and her sister Cathy, who's my age, and their older brother Duane, the oldest of us Shie cousins. Uncle Russell always tried to give us kittens. Now I know how he felt! You wantum cats??? The move to Virginia has been in the planning process for about a year, I think, so April was the big Final Push! 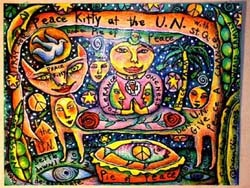 Meanwhile, I put this drawing, "Peace Kitty at the UN" on eBay about two days before the US went into Iraq! There had been all this arguing at the UN, with most countries demanding continuing weapons inspections, and with Bush really wanting to attack. I pictured this Peace Kitty, with St Q riding on her back, strolling into the UN and getting everyone settled down, bringing Peace. But timing is everything, right? Mine was pretty bad! It's clear my Peace Kitty didn't work her hoodoo very well, as we indeed went to war. I like the piece a LOT, but it only got one bid and sold. Luckily, its new owner likes it a lot, too. See, we've got a big Pie of Peace there, and some PEAS, and some of those red roses I'm currently addicted to. 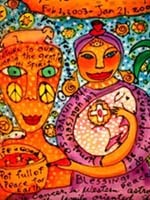 I put in a peace dove and some big eyes of conscience, and a good smattering of Peace Symbols, for good measure! Don't leave home without 'em! Don't wear one on your back, or somebody may shoot you! I think Peace Kitty is still hanging out around the UN, since there seems to be a lot of healing that needs to happen there. It's wonderful and amazing that the Iraq invasion lasted such a short time, but it doesn't seem stable yet, and the Iraqis don't seem to trust us very much. Pray for Peace, still, still! Jimmy has good news! He's got a 16 page article on his unique fly fishing cases, and it's gorgeous, in a beautiful magazine, Art of Angling Journal. Their site has a page just of his article, which shows four full pages just of his stuff in the magazine. You can order the mag, issue #4, on the site, or get it at any fly fishing shop, not regular bookstores. With the recession really slowing down his orders this last Fall and Winter, the article has got the orders flowing again, and it's great that he once again has a nice waiting list for his custom made, one of a kind work. There is truly no one else in the whole world who makes anything like the art leather Jimmy makes, and now the article has validated his work as definitely collectible. And the images in the article leave no doubt of all the careful hand work he puts into making each case. I'm so proud of him! To look at his custom work of individually ordered pieces, which he makes totally by himself with his own designs, with each one signed, dated, and numbered, check out James Acord's Leather. I put a picture of Jimmy's most recent custom order piece here to give you an example of his work. 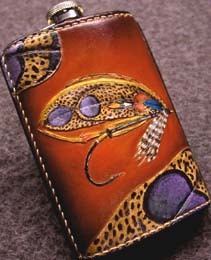 The salmon fly Jimmy illustrated in tooling and painting on this hand made flask was designed by Paul Schmookler, the publisher of Art of Angling Journal, and now it belongs to Paul. April 14 - 16, Jimmy and I drove down to Sugarcreek, Ohio, to participate in teaching at Artsweek at Garaway Schools, which we've done for a long time now. This is a picture of me working on a wooden cabinet, in our Painted Diary Furniture class. I'm making it into a recipe cupboard, with lots more paint and writing yet to go. The students in this class were making book reports on their furniture pieces, with paint and writing. (Being a teacher, I pulled rank and didn't have to do a book report. Nice!) Our other class did diary self portraits on stretched canvas, with acrylic paints. Garaway's program is outstanding, and it was sad that budget cuts made the project only three days, instead of the former five days, this year. Still, to have a school stop what they're doing and take time out for everyone to do only art, for even three days, is stunning! Bravo, Garaway! Plus, we got to enjoy watching the Amish and other farmers start to plow their fields, as we drove down to Sugarcreek and back each day. On our hour long drive, we saw lots and lots of plants coming up, about a week ahead of Wooster's Spring flowering. And of course, Monday is wash day still in Amish culture, so we got to see lots of pretty and orderly clotheslines full of fresh laundry. Slides were due at the end of March, for the Quilting Arts Magazine calendar contest this year, for the 2004 calendar. I started my effort a second time, as the first painting I was quilting had too narrow lines from my early Airpen work. I just couldn't imagine beading next to them and having the lines hold their own. So I started over and worked very hard, all through March, to finish a quilt called "Year of the Monkey". Actually, I made four paintings of it, all different, using the Airpen and my Deka paints, and then I chose my favorite to quilt. 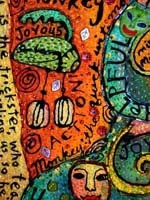 The photo here is of a detail of the piece I entered in the competition. And right now, it's in Stow, MA, for the second jurying, the final selection for 12 months and a cover for the calendar, out of something like 34 semi-fianlists. The real Year of the Monkey is next year, so that's why I used Monkey for the quilt. I plan to make one for each year, and hope to submit them by deadline to the Quilting Arts Magazine contest, as long as they hold it! 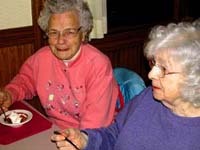 On April 18, because Aunt Pauline was getting close to her move to Virginia to Candy's house, Candy, Pauline, and I went down to see my Great Aunt Alta and my cousin Mary Jo, Alta's daughter, who live in Jelloway, Ohio. Alta is 92 or so now, and Pauline is 89, and Candy and I had this big idea that we need to get these Grand Dames to talk about their family memories, so we can know more about our heritage. I took my digital camera, and Candy brought a video camera, and we met in Raider's Restaurant north of Jelloway...and Aunt Alta ordered the Jell-O!!!! I had to take a picture of Jell-O in Jelloway, didn't I???? Candy said I couldn't joke about that, but when Alta ordered it, we both about passed out, and the floodgates opened, and we made our cute little Jell-O in Jelloway jokes. Aunt Alta says the little hamlet is named after the Jelloway Indians, and there is a creek there called Jelloway Creek. Do you suppose indians invented Jell-O?????? I bet they did! So we had a great time, listening to stories Alta and Pauline came up with, especially after Candy, Mary Jo, and I walked up a BIG hill , through the fields and woods, to look for mushrooms! Mary Jo lives there - it's her house. She walks up there a lot. But I really got some major hot flashes going, puffing my way up that hill! I whined that it was too early for mushrooms, since Dad always said you have to wait til the May Apples are blooming, near ash trees, and mushrooms come up best on a hot day after a good rain the night before. I had always been pretty rotten at finding mushrooms as a kid, so I decided I should use a little stick and poke around the base of an ash tree, if this thing really WAS an ash tree, even tho the May Apples were very young yet and certainly not blooming. In the course of reminiscing about their youth, since both Alta and Pauline were born in the Snyder Mennonite Community near Plainview, Texas, in the 19-teens, Alta pulled out some very old family photos. My great grandfatheer, Peter B. Snyder, got sucked into buying a bunch of land down there, being told it was a land of milk and honey, perfect for farming, like all those Mennonites were used to doing in Illinois, Ohio, Wisconsin, etc. Well, he was a good man, but maybe a bit too naive! He got people from all over the country to charter box cars on trains down to Plainview, as soon as the railroad was built to it, around 1907. Joe and Mary Hartzler and their children were one of the families Peter B. talked into moving to Plainview and buying land. Joe was Alta's dad, a wood carver in his retirement, and he lived to age 100. I remember him from my childhood. Alta pulled out really old pix of Great Grandpa Joe, from when he was a little boy and on up! His looks reminded me of my brother Larry! I'd never seen these very early Joe Hartzler pix before, but he WAS Alta's dad, so if anyone would have them, it would be her. My Grandma Snyder, named Ellen Hartzler, was a much older sister to Alta, and in the photo above, Ellen is holding her baby brother, my Great Uncle Paul Hartzler, in Texas. Paul was a few years older than Alta, who was six or seven when they all left Texas to come back to Ohio. Grandma died in 1944, after Mom finished nursing school, but before Mom and Dad got married. I am very happy to say that my digital camera turns out to be wonderful for taking images of old family pictures, because that's what this is! I've never seen a photo of my grandmother at such a young age before. She and Grandpa got married in 1910 in Texas, where they met. Aunt Pauline's father was a brother to Alta and Paul and my grandma, and I think he was older than Grandma, because he and his wife had Pauline down there in Texas. Are you following this? I think it's totally absorbing, but you may be falling asleep now! Sorry! Off we go! Now it was April 19, the evening before Easter, and we attended the long and beautiful Easter Vigil Mass at St. Luke the Evangelist Church in Lakewood, where Gretchen was baptized, and she and Mike both joined the Church. I've been to masses before, but never to anything this full of pagent and meaning. Of course, because "my kids" were involved, I know it was more important to me. Here are Sister Barbara Ann, Mike, and Gretchen, at the reception after the mass was over, celebrating all their hard work of many months of study together, since last August. Sister is in charge of education at the church and conducted the weekly classes for the five candidates. Jimmy and I haven't spent this much time in a church all at once, maybe ever... 8:00 pm to almost midnight! Jimmy is now full of enough religion to last him a long time, I just know! But I liked the service a lot and am especially happy that Mike and Gretchen are pretty equal in their desire to be members of the Church now. They're planning to start a family soon, so this all was part of the hard work on that path. And whether or not Jimmy digs long church services, all of us parents are psyched at the thought of becoming grandparents. Jimmy seems determined that baby girls, as well as baby boys, can be trained to fly fish at an incredibly early age.....! After arriving home on Easter morning at 1:30 AM, Jimmy and I didn't make it to any Sunrise Service, just like every other year! Only this time we had a good excuse! But we did rally around to thaw out our prize winning shrimp ring and get over to Mama Wanda's for Easter dinner in the early afternoon! All of Jimmy's siblings and their families arrived and we had a super meal and time together. Here is Mama Wanda herself, holding Tazia, her great granddaughter, and Karlie, her granddaughter, who is younger than Tazia. Karlie had been napping before the picture, but soon rallied around and got at least mildly kid-crazy, so we all had a good time. I'm a real sucker for these two little girls, myself, and am trying hard to locate some new plastic patio owl lights, so Jimmy can take down the old ones, clean some up, and give them to the girls for playing Bowling Owlies, a game I introduced you to in a diary a year ago or so. You need some big wooden BOWLS, some busted patio owls, and a bean bag tiger, to throw at the owls, who are carefully placed on top of the bowls. Bowling Owlies. It's all the rage in our house! Anybody know a good place to buy owl lights right now? Wal-Mart seems to think they're not sale-worthy this year! Boo! Patio owls out of style????? Well, we're in Lowell now. You're looking at the end of a really cool building on Merrimack Street, where Friends Fabric Art sits. See the sign? This new store's only been there since last June. What a place! About a block from the New England Quilt Museum and two blocks from a big fat parking garage, Friends Fabric is to surface design, what Paint-a-Pot stores are to ceramics. Only this is the very first one ANYWHERE for fabric! Ann Lee and her daughter Sonja Lee loved to go to Paint-a-Pot stores and came up with having a store like that for garments, bags, hats, tablecloths, etc. You go into the store and look through the Prepared for Dyeing (or Painting) things from Dharma Trading Company and other suppliers. You pay for the surface treatment that you'll do to your piece, when you buy it, as the price includes supplies. You just walk in and start working! Or plan ahead and bring your Girl Scout Troop, or your birthday party! This is the logo Ann and Sonja designed for the store, and here it's on the front door. 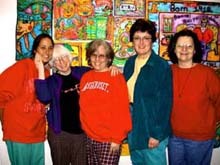 Maxine Farkas, nationally known quilt artist and director of Quilt 21, a high profile touring quilt exhibiton organization begun in 2000, now works for Ann and Sonja, and between the three of these women, they have every skill you'd ever need to keep this store growing for a long time! 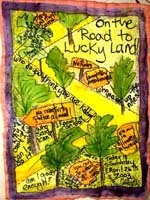 I'm so excited, because I got to teach the first ever visiting artist workshop there this last weekend, April 26 - 28. And I just was stunned the whole time, as I watched Lowell citizens just pop in off the street, hem haw around a bit, then sit down and make their art. Nobody knows quite what to do for the first ten seconds or so, because it's such a new concept! But that friendly logo, those welcoming kitchen tables set all around the large workroom/showroom, and the relaxed and happy staff soon get everyone merrily creating! I wish I could do a documentary about this experience, not just a little section of my diary here! Look! Here are Sonja, Ann, and Maxine, working on their own projects from my little three day class, after everyone else had gone home. They might as well live at the store, as their hours are 9 AM to 9 PM, some days! But they have everything they need to get through the day and are so supportive to each other, that they only miss being on the Outside a little! I suggested building a nice nest, made of blankets and such, strategically hidden behind the big cupboards of Dharma clothing. Then a staff person could sneak back there and konk out once in a while, if someone else was there to cover for them! Oh, I forgot to mention, that besides the stash of white garments, etc, and the cool padded kitchen tables to work on, a long side wall of the store is packed with paints and dyes, brushes, etc, for using with the work. Further along this wall, more shelves are loaded with beads, embroidery thread, artsy buttons, etc, for separate purchase, to embellish the work, for the icing on the cake! You can go there just to shop for dyes, paints, brushes, beads, threads, and so on, if you want to work at your own place. I'm sure they'd sell you fabric, too. Or you can go to the other extreme and buy a pass, so you can always work there on your own stuff, messing up their space, instead of your own! Heaven!!!!! 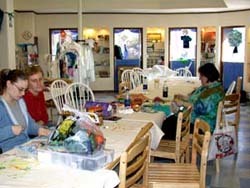 In my class, we worked with my Lucky School of Quilting processes: both with my odd painting to quilting techniques and my odd sewing methods for appliqued quilts. The staff at Friends Fabric Art also teach a lot of surface design techniques, but wanted me to come to teach, because I work so entirely differently from anyone else... except people who've studied with me. So I came from my planet to theirs, and we all had a great time. The first day we painted small and larger diary images on Kona PFD white fabric from Lunn's. Then the second day we sandwiched the smaller, 5" or so square piece and began to sew it. In the photo above is Maxine's larger piece, 11" x 8.5", which she was sewing on like mad the last day yet. Her three pieces fit together in theme and colors and resembled her own normal work style, with my corruption added! We each started those two painted pieces, as well as a 5-6" square appliqued piece, using the techniques I describe in my basic Lucky School of Quilting applique processes, in which you sandwich and finish the edges of your "quilt" first. 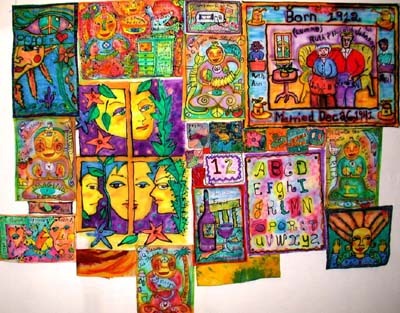 Let's just call them Outsider Art Quilts and let the snippy ones who insist I can't be an Outsider Artist go eat their chocolate somewhere else! I had a super class full of 20 artists, happily working away on three Lucky Samplers each! Wonderful stories on all, and very good compositions, to boot. I taught 14 students at once to do Shisha stitches around mirrors, in the last afternoon session, followed by my Lucky Holes teaching. What I didn't get around to teaching was: Airpen, shrink art, and airbrush. Jimmy would be the airbrush teacher, so that means coming to our house for that education at Turtle Art Camp. But next time I teach in Lowell, I hope to do Airpen and shrink art. Either it'll be a longer class, or something else has to go, because we were super busy the whole three days, packing in demos and work time. What a great group! I'm sorry I don't have a group picture, because some students left after two days, and even if I had gotten pix of them working, I accidentally erased my pictures taken Friday through Sunday! Ugh! My Lowell photo diary starts at the Four Sisters Owl Diner, Monday morning! 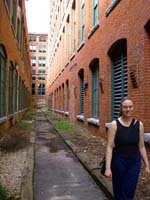 This is Sonja, who let me stay in her new condo in Canal Place II, an old textile mill turned into apartments in the 80s. We're standing outside the condo, on the side away from her windows, because you can't stand outside on the window side. One of Lowell's famous factory-powering canals, the Lower Pautucket Canal, is totally, 100% up against the outside wall of the condo on that side, with NO yard or sidewalk between them and another factory building making the other side of the canal. I figured the water line is about five feet below the windows! And this is what made me name Lowell "The Working Girl's Venice," last year, when I fell in love with Lowell and her canals, when I went there to give a slide talk at the quilt museum. They built the canals to power the mills, so if you built a new factory, they'd dig a new canal over to you, in the early 1800s, and the mill girls would run the power looms from turbines powered by the canal water's force. Whew! 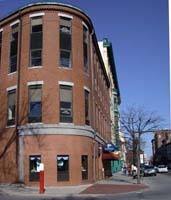 There are old factories everywhere in downtown Lowell, now a national park, becoming more artsy as it becomes rennovated. Now they have a cool new coffee house, Higher Ground, and a great new museum called The Revolving Museum, which I'm sad to tell you does not have a revolving door on it. But it is very funky and does great exhibits to bring art to the community. I think if Gretchen and Mike and the rest of our family would move to Lowell, maybe I could talk Jimmy into it! Max and I would get into lots of trouble, it's true, but we'd also come up with wonderful art schemes all the time. I could become a chocolate tester for Jacques of Belgium and use the money to buy one of the cool condos on the canal! Then I would walk (or possibly roll) the sweet little two block walk over to Friends Fabric Art and teach more innocent people how to make Lucky Outsider Art Quilts every day or so! Oh, and we could buy out the Barnes and Noble Bookstore, just down the block from Friends Fabric Art, and hold Turtle Art Camp there, or in Canal Place II! But until then, I'll try to get back to Lowell when they'll have me, and you can come there or come to camp here any month of the year! 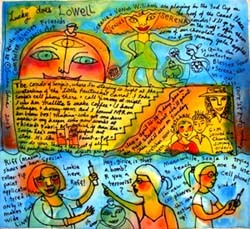 This is a little painting I made last Friday about my adventures in Lowell. I forgot to tell you that Venus and Serena Williams were playing tennis in Lowell when I was in town. They had the Fed Cup there, and they played against the Chech Republic, I think. Guess who won. I had a great vision of them playing the Fed Cup on the roof of Canal Place, the condo building/former mill. Billie Jean King was there, too! Oh, and St Quilta the Comforter! You can see us getting into all kinds of mischief in this diary painting, and it was just the start of the adventures that weekend! Truly, Venus and Serena made an incognito effort to have someone call ahead and get them into the highly cool Four Sisters Owl Diner on Sunday morning, but the Four Sisters were so busy serving food, they hadn't realized Venus and Serena were even in town. They told the mystery caller that they don't do reservations, and so they sadly missed the great photo op I didn't have time to draw and paint about yet. I may still make a drawing to send to the diner, so they have something to show for the Fed Cup weekend, at least! I can rewrite history as well as anyone! I'll have the tennis divas chowing down on Merrimack Omelets, with all four of the sisters happily getting into the picture! 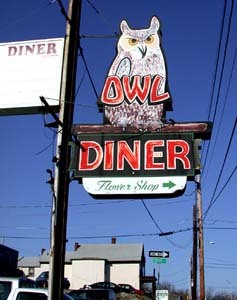 And the best part: the diner has a gigantic OWL on its sign, and it even looks pretty evil, if you ask me! This owl is watching everything that goes on in Lowell! Its sight is so good, it watches everything that goes on in the whole world! So straighten up, you hear? Well, I'm pretty slap happy now, at it's about 11 pm. By the time I get all these pictures online and check to make sure they all show up in the diary on the site, it'll be Box Merlot drinking time around here. Too bad I gained five pounds in Lowell, coz I sure would love some of that chocolate I forgot to take with me. See you around August 1, with my next diary. Biggest adventures to come between now and then are my class in Montreal at Carole Segal's Fine Art Studio and selecting the anarchial GREEN QUILTS Award with Robin Schwalb at Quilt National. Oh, and some wild Turtle Art Camps here at our house! Garden should be all full by then, if we get it planted! Happy trails and give peace. Love, Lucky Magnolia, blooming right now.